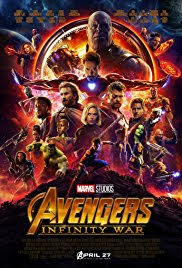 Review: The Avengers and their Super Hero allies must work together to stop the powerful Thanos from destroying the universe. Dear readers, before I start on this film review I thought you might like to know that this is my 800th film review! What better way to celebrate than to review the incredible Avengers: Infinity War. I like the fact that it takes you right into the film and doesn’t mess around with all the credits beforehand. It is a very long film with the length being two and a half hours. Not many people would agree with me about this but I did find that half an hour could have been taken out. It was a bit too long for my liking. I liked how all the characters were all bought into this film and each had their own part to play. The size of the cast is enormous. Each superhero has a part to play such as Iron Man, Spider-Man (Tom Holland), Thor, Captain America, Doctor Strange etc. It was lovely to see the cast back from Guardians of the Galaxy especially Rocket. This film is released five days before the tenth anniversary of Iron Man (2008), this was the first movie in the Marvel Cinematic Universe. The two directors have done an amazing job with this film considering there was so much expectation to get it right. This would be down to the cast, to work out which character does what, how to bring them into the story and also that the whole story makes sense. The battle scenes were very impressive and a lot of thought had been put into them. One thing I did find was that it does take the whole Avengers world seriously. I am not sure how much of the filming was filmed at Durham Cathedral but the security was so tight that not even the Cathedral wardens were allowed access inside. The best tagline in the whole film is “I am Steve Rogers”. There is a lot of humour and I also found myself laughing quite a few times which I was not expecting and I even took myself by surprise. If you haven’t watched the film yet then I would suggest you stay till the very end until all the credits have gone. I am already looking forward to the next Avengers film which should be out 26th April 2019.